Akerson: “If I were an Apple shareholder, I wouldn't be very happy. I would be highly suspect of the long-term prospect of getting into a low-margin, heavy-manufacturing” business. SAN FRANCISCO (Bloomberg) -- Dan Akerson, retired CEO of General Motors, said Apple Inc. should steer clear of the business of making cars, though a push into automobile electronics would be a better move for the iPhone maker. Apple shares rose to a record on Tuesday after people familiar with the matter last week said the technology company is working to develop its own electric car, rocking the automotive industry. “I think somebody is kind of trying to cough up a hairball here,” Akerson said in a telephone interview. “If I were an Apple shareholder, I wouldn’t be very happy. I would be highly suspect of the long-term prospect of getting into a low-margin, heavy-manufacturing” business. The car industry, with regulatory and safety requirements, is harder than people realize, Akerson said. “A lot of people who don’t ever operate in it don’t understand and have a tendency to underestimate,” he said. For Apple, there’s more potential in teaming up with automakers to produce the electronic operating systems and entertainment equipment for vehicles, similar to how car companies buy headlamps from other suppliers. Tom Neumayr, an Apple spokesman, declined to comment. The company hasn’t discussed its car work. Akerson, 66, led GM from 2010 until last year, when he stepped down to care for his wife. As CEO, he pushed the automaker to move faster to implement new technologies in its vehicles, including 4G broadband cellular service, and to expand the company’s electric-car offerings. “Look at the margins of an iPhone versus a car,” he said. “I’d rather have the margins associated with the phone and produce” 74.5 million of the devices, as Apple did last quarter, he said. Apple reported net income of $18 billion for the quarter that ended in December, along with gross margin of 40 percent. GM posted a profit before cash preferred dividends of $1.99 billion during the same period, and its gross margin -- the percentage of sales left after subtracting production costs -- was 14 percent, according to data compiled by Bloomberg. The automaker was hurt last year by record recalls, including an ignition-switch defected linked to at least 56 deaths. Optimism about Apple has been growing since CEO Tim Cook revealed larger-screened, pricier iPhones in September, helping to fuel record profits and adding to the company’s cash hoard, which totaled $178 billion at the end of December. The company’s market value stands at about $745 billion, making it the world’s largest company by that measure. The company’s secretive electric-vehicle project, code-named Titan, resembles a minivan, a person with knowledge of the company said last week. The effort may not lead to the company introducing an automobile. 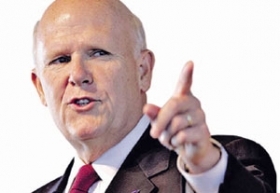 Akerson himself was new to the auto industry when he joined the company’s board as part of the U.S. government-backed bankruptcy reorganization in 2009. He had spent his previous career in the telecommunication industry, including time as president of MCI Communications Corp. and CEO of Nextel Communications Inc., General Instrument Corp. and NextLink Communications Inc., which became XO Communications Inc.